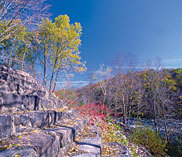 Named for Josiah White, co-founder of the Lehigh Coal and Navigation Co., White Haven today stands as the northern-most gateway to Lehigh Gorge State Park. It is best known for its rails-to-trails hiking and biking routes, whitewater rafting and paddling opportunities. Here canal-meets-railroad and a community was born. In the 1800s White Haven enjoyed the enviable status of being the point where canal met rail. The Lehigh Canal began its southerly journey downstream to Easton, while the Lehigh & Susquehanna Railroad stretched north to Wilkes-Barre. Thanks to its status as a key link in the anthracite-shipping network, White Haven prospered. A visitor to town may have seen hundreds of railroad cars, laden with mountains of stone coal mined in the north. Also abundant was timber cut from White Haven’s surrounding forests – all waiting to be transferred onto the Lehigh Canal’s barges. When a flood washed out the canal in 1862, railroads took over as the prime means of shipping goods and people. Following alongside the Lehigh River’s banks were the tracks of the New Jersey Central Railroad. A block away was the Lehigh Valley Railroad. Main Street ran between the two and housed two railroad stations, a pair of hotels and various stores. The stations and passenger trains have long since vanished, but you can still hear the whistle of Reading, Blue Mountain and Northern Railroad freight trains passing through town. Railroad buffs journey to White Haven to see the restored, 29-ton, yellow, Union Pacific caboose that sits along South Main St., housing railroad memorabilia. To reach the White Haven Access Area, take Exit 273 on I-80. Follow PA 940 east to the White Haven Market and go through the parking lot. Then bear left until you reach the parking area and trail head on the Lehigh River.